First Communion Preparation: Children who attend public schools who are in grade 2 or older and would like to make their First Communion need to attend Wednesday evening Faith Formation classes from now until the First Communion Masses in May. To register, visit www.st-matts.org and click the “Faith & Learning” menu. Or register at the Parish Center on Wednesday evenings between 6:30 and 7:30 PM. Wednesday evening Faith Formation classes for the 2018-2019 school year have started. 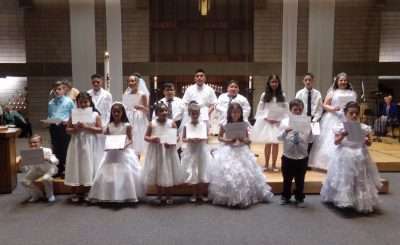 Classes are held weekly and are required for children who wish to receive First Communion. Registrations ends soon. Confirmation Preparation: Registration is now closed for Confirmation preparation.